If you're looking for a bright, sunny addition to your flower bed, you can't go wrong with the gerbera daisy, (Gerbera jamesonii). Available in a rainbow of bright colors, including orange, red, pink, yellow and white, gerbera daisies are especially exciting when planted in front of evergreens, where the colors will show up in stark contrast. Gerbera daisies are perennials in warm climates, but because they won't tolerate freezing weather, gerbera daisies should be treated as annuals in cold winter climates. Purchase gerbera daisy bedding plants at a garden center or greenhouse. Water the gerbera daisies thoroughly the day before planting. Plant gerbera daisies in well-drained soil that has been enriched with organic matter. Cultivate the soil to a depth of 8 to 10 inches and mix 1 to 2 inches of compost or peat moss into the top of the soil. Gerbera daisies will do best if they are planted where they are exposed to morning sunlight, and in shade during the hottest part of the day. Remove the gerbera daisies from the planting containers, and loosen the roots slightly with your fingers. Plant gerbera daisies 12 to 18 inches apart. Be sure to plant the crown, or the top of the gerbera daisy plant, slightly above the top of the soil. Water the gerbera daisies thoroughly after planting. Apply 1 to 2 inches of organic mulch around the plant, but avoid covering the crown of the plant. Organic mulch will retain moisture and deter weeds. After planting, allow the gerbera daisy plant to dry out slightly between each watering. Fertilize gerbera daisies every six to eight weeks during spring and summer using a timed-release fertilizer. If you prefer, you can use a regular fertilizer for blooming plants, applied monthly during spring and summer. Replant gerbera daisies every two years if the plants are grown as perennials. Dig the plant and the root ball with a shovel or garden fork and replant the gerbera daisy with the crown of the plant above soil level. This is important, because over time, the crown of the gerbera daisy plant will sink below soil level, and the plant will eventually be killed by crown rot. Gerber daisies are often purchased as blooming indoor plants. 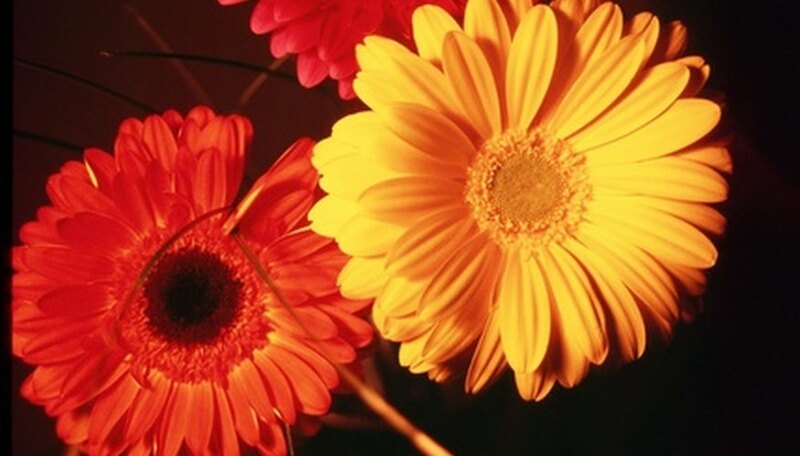 Indoors, gerbera daisies should be placed in a sunny location, or under a grow light. Keep the soil moist and fertilize every other week with a liquid houseplant fertilizer. Gerbera daisies grown in this manner are usually discarded at the end of the growing season.